What do you Meme a Walmart?! 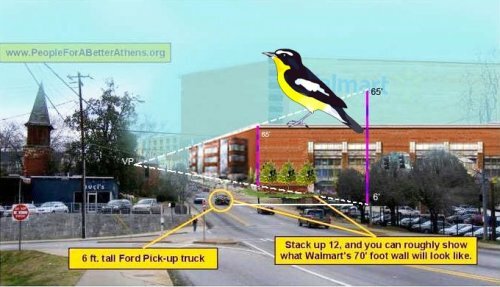 For the past several months, Athens has been up in arms over a proposed Wal-Mart grocery store/mixed use complex in an area across the street from Nuci’s Space (and THE steeple). Obviously, this has been a big issue and one I’m really not going to pontificate over here despite my personal opinions. 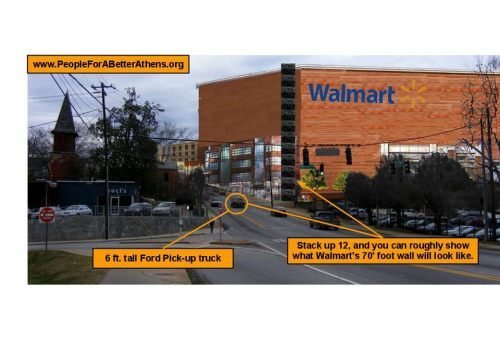 So in order to put a sense of scale and proportion to the Walmart, the anti-Walmart group “People for a Better Athens” released the following picture. This picture circulated around our tiny scene via facebook (and yes, I shared it too). So, naturally, Selig, the company in charge of the new development, wanted to correct this butter-colored mound of awful. Of course, they redirected people to their site and a good “artist’s rendering” of what the site will look like. The fact that I highly doubt it’ll look like that either aside, PFaBA released another photo. The truck is very important, ok? Meanwhile, an elderly driver decided she wanted her Westside Transmet to have a drive through. Still following? Ok. It all makes sense later, trust me. 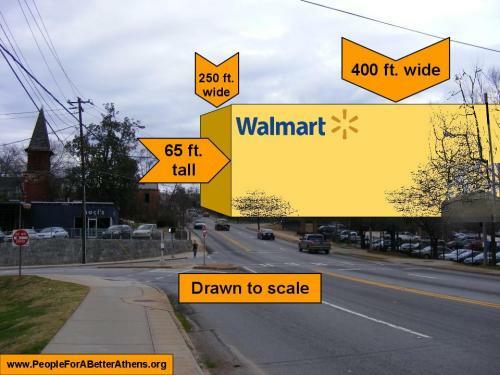 All this fuss over the Walmart scale model photos led to one Athenian posting the following picture. PUT A BIRD ON IT. It’s art. Then the Transmet incident got mixed in and now we really have the greatest place on Earth thanks to Michelle. Welcome to Athens, GA memes.